The host of Women Worldwide, Deirdre Breakenridge, welcomes her guest to the show, Blanca Cobb. Blanca is the CEO of TruthBlazer. 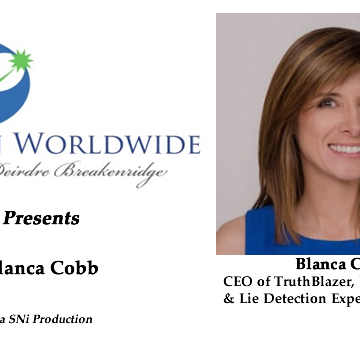 She is a nationally recognized body language and nonverbal communications expert who uses her behavior analysis expertise and psychology background to get to the truth. She is also a Senior Instructor at the Body Language Institute in Washington, DC. Blanca is an ‘in-demand’ media guest, keynote speaker and coach who breaks down the complexities of human behavior to help people succeed. She’s been featured on HLN's Dr. Drew On-Call, Good Morning America, CNN, USA Today, FOX, ABC, CBS, NBC affiliates, and the list goes on. On the show, Blanca shares tips on body language and confidence in the boardroom, what do do if someone’s body language intrudes on your space, as well as how the presidential candidates are using their body language during the recent debates. She also discusses different ways to calm your nerves before a big meeting or event, and imparts advice to listeners about how to expand their presence in a bigger way. A little more about Blanca … Blanca uses her people-reading secrets and lie busting techniques to put you in the know, whether it’s understanding what politicians are really saying with their body language on the campaign trails, or what your partner’s smile really implies when you talk about settling down. Blanca empowers people with body language skills to get ahead in both their personal and professional lives.